Bull Riding toys. 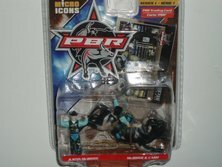 PBR toys. 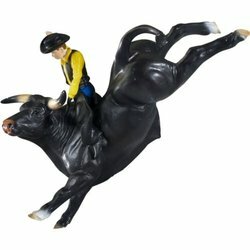 Large collection of bull and bull rider toys. Rodeo arenas with bull riders and clowns. Bull toy to ride on. Bouncing bull. Stick bull. Bull rider vest and chaps for kids. Bucking chute. 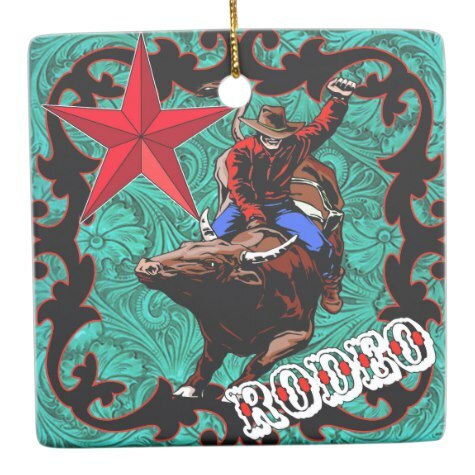 Bull Riding Christmas ornaments, stockings, gift wrapping also. Hold on because we are getting ready to turn out the best bull riding toys around. 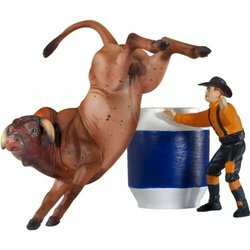 There are small bull riding toys with bull rider action figures, rodeo clowns and arenas for lots of fun play time. 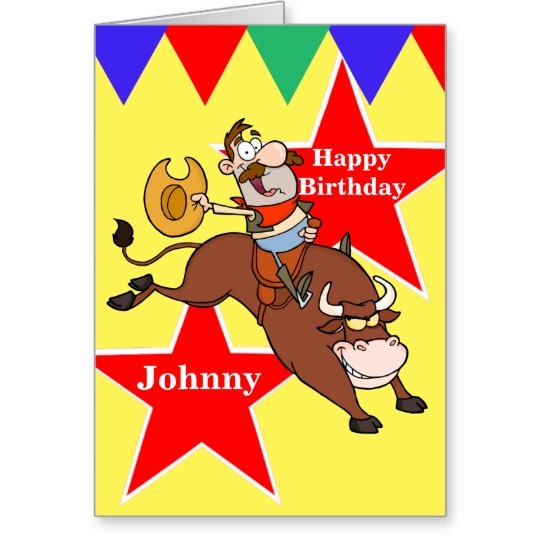 Then get ready to ride on a bouncy bull, rocking bull or even a stick bull. 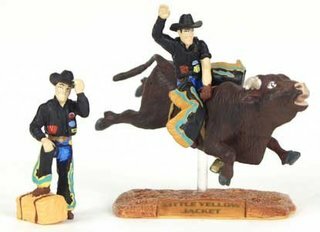 You will also find your favorite bulls from the PBR along with cowboy action figures to play with or collect and some soft and cuddly bulls for the littlest bull riding fans. This is a 12 piece PBR 1:20 scale play set. 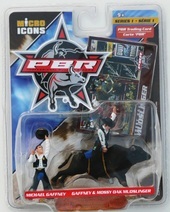 It comes with a bull rider and Flint the clown figure to take on Bushwacker, the 2011 PBR bull of the year. The bull will come apart from the stand and the rider will come off of the bull. 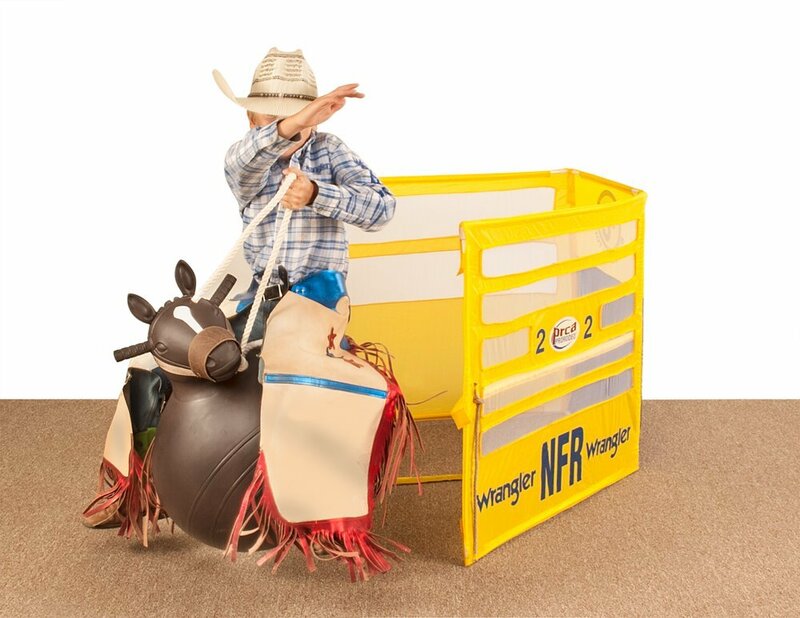 ​This cowboy bull rider play set is made of plastic. It is highly detailed and hand painted. 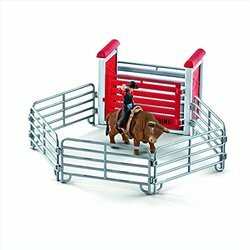 ​The Priefert bull riding arena set shown above includes fences and bull pens. There are also 3 bucking bull and 3 cowboys. These pieces are available separately if you don't want or need arena fence pieces. Flint the rodeo clown comes with a barrel and is a 1:20 scale figure. 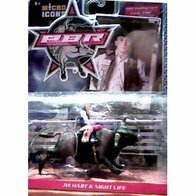 This is a 1/16 th scale bull and bull rider set. 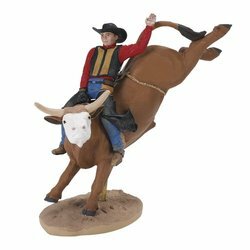 It is made of solid plastic and the rider can come off the bull. This bull toy is recommended for kids 7 years and up. The bull measures 5.5 x 5" and is hand painted. Add Jalapeno to your pen of bulls. This one is made by Breyer, a top name in collectible toys. 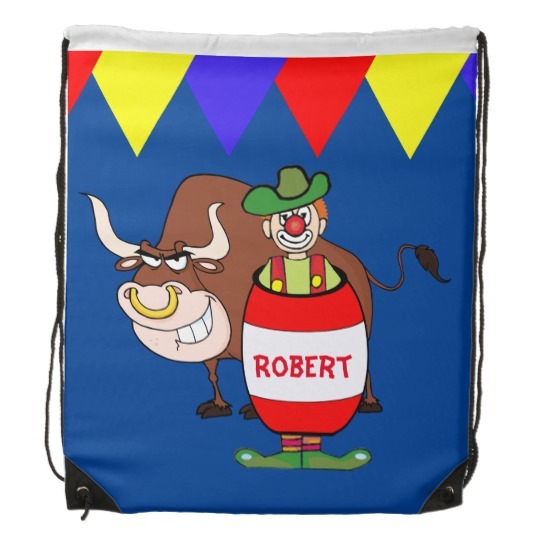 It is hand painted and comes with the rodeo clown and barrel. Loco Louie is another bull from the Breyer collection. 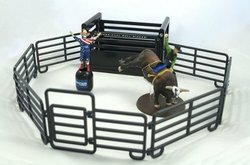 The set includes the bull, rider and 4 pieces of fencing. 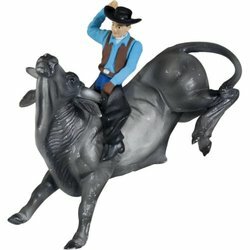 Rollercaoster , the bull is made by Breyer and is hand painted. It also includes the bull, rider and fencing. 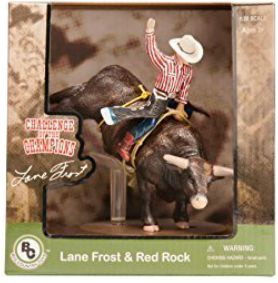 This is a 1:20 scale hand painted toy figurine featuring Lane Frost and Red Rock. 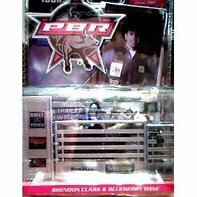 PBR Bull and Rider action figure collectibles with trading cards. This does come packaged like the others below. Kids will be happy with soft toys that they can carry around and play with or cuddle up with for a nap. Tornado PBR Bull is scaled down for some kid size fun. He is 11 inches long with soft and cuddly brown fur. This is Bubba the bull. 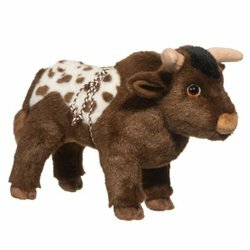 He is a soft and floppy 12 inch bull that kids will love to hold onto. Mary Meyer Flip Flops, Bubba Bull, 12"
My grandkids find a way to make anything into something they can ride or rope. Here, grandson has turned the calf roping dummy into a bull. 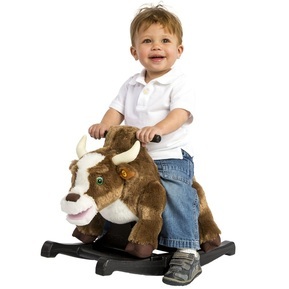 Kids will have a big time bouncing and bucking on a ride on bull toy that is made just for that. Benny the bull does come in other colors besides blue. The height of the saddle is 13" when it is fully inflated. Benny is made of heavy duty vinyl and will handle up to 150 pounds so kids will get a long time of use out of this one. There is a hand pump included. Bouncing ball toys that are big enough to sit on are always fun. If there is a bull riding fan in the crowd they will be really pleased to see these bouncing bull ride on toys. Mom or dad can count out 8 seconds and then blow the whistle while kids pretend to be on the biggest bull around. They are lots of fun to use for races too. There is a very cute horse bouncing toy also. 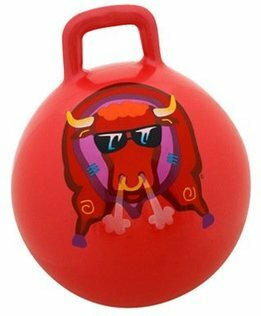 These bouncing balls are designed with a picture of a bull's face on the front, and you guessed it, the bull's behind on the back side. They measure 18x18x18 round. 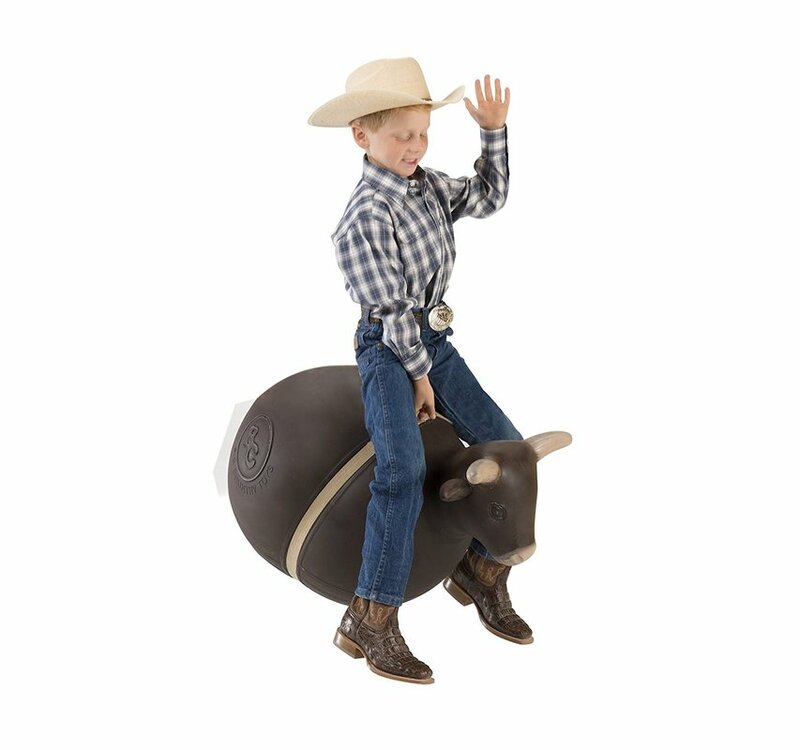 ​​This ride on bouncing bull toy has a realistic looking bull head and comes with a bull rope hand hold. It is 16 inches in diameter and is recommended for kids ages 3 to 6. A dual action pump is also included. 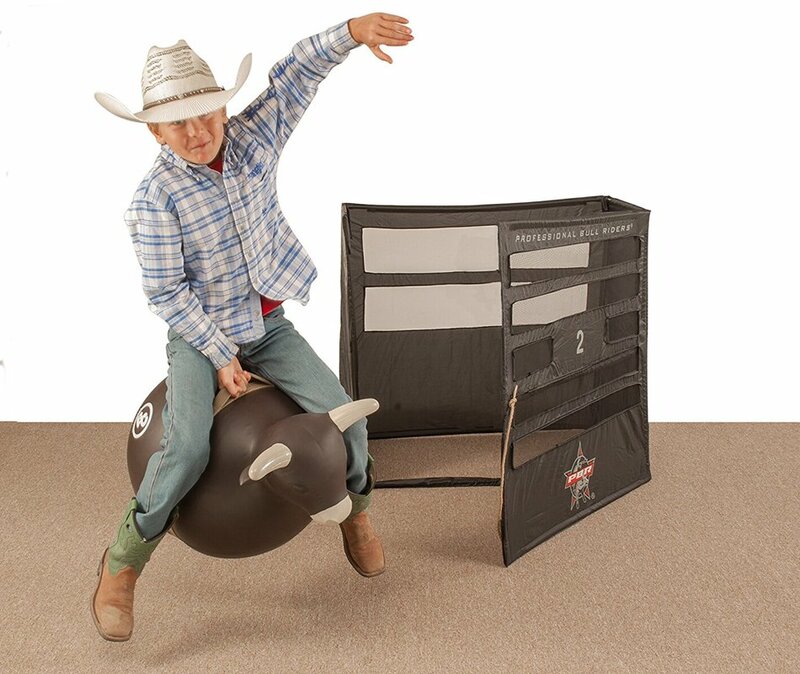 This is a newer bull riding bounce toy that is recommended for kids 18 months to 3 years old. I am happy to be able to add this bucking chute toy. I just wish it came with a remote for that gate. hahaha. Someone is gonna have a good time playing the gate man too. These are made out of nylon and PVC and come in a handy carry bag so they can be stored or travel with the little cowboys to their next rodeo at grandmaws house. It measures - 36" x x32.5" x 24" . There are two different versions of this bucking chute. 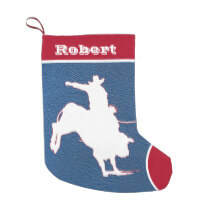 The one above with the PBR brand and the other shown below with the Wrangler NFR logo. Here is a fun toy for the summer time. You should watch the video on the product page. It reminds me of when we had a buckling barrel at the house. ​​Take turns riding this inflatable bull water toy. Stay on for 8 seconds with yours friends keep him bucking using the side handles. 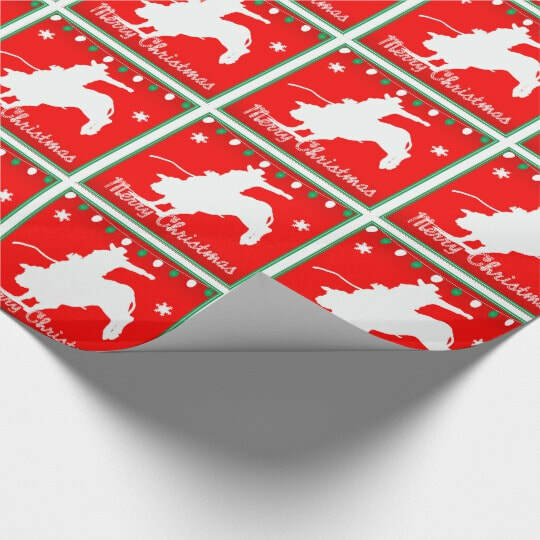 It measures 96 x 77 x 32 inches and has a realistic photo print design. 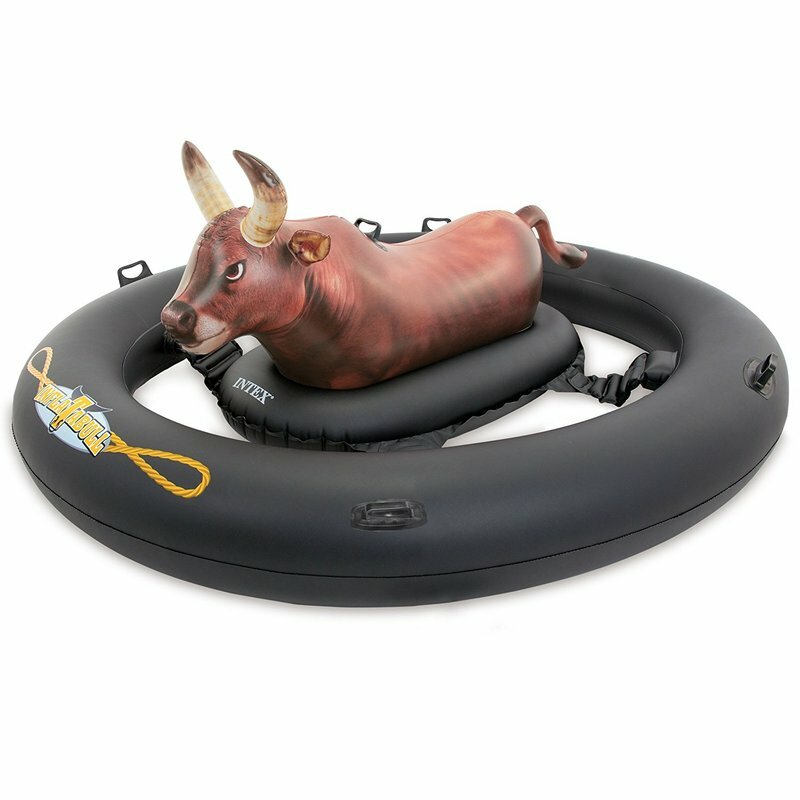 The bull can be used in pools, lakes or rivers as it is made of sturdy 17.5 gauge vinyl. 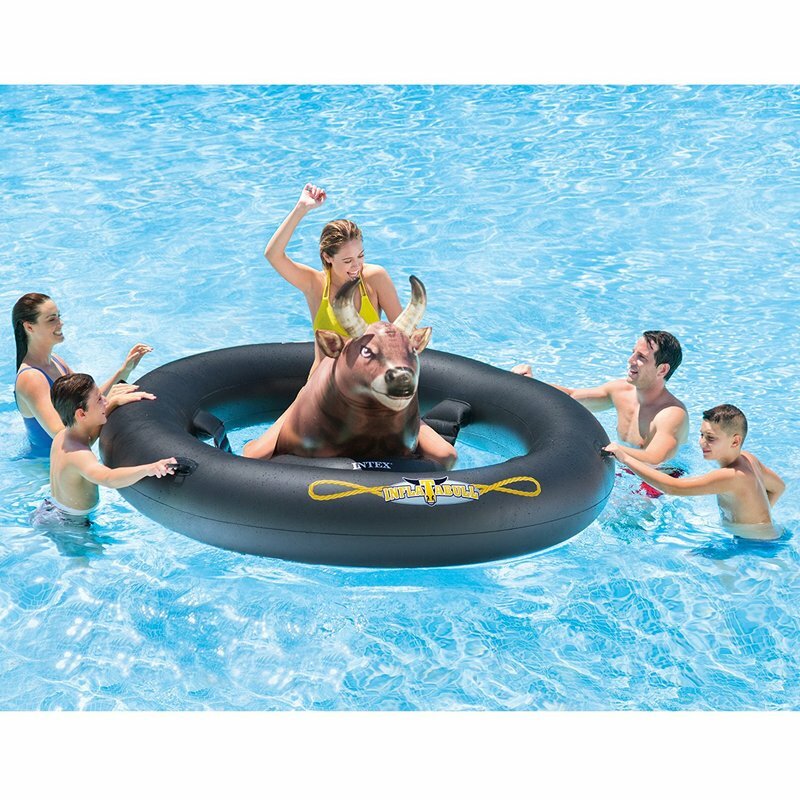 Intex Inflat-A-Bull, Inflatable Pool Toy, 96" X 77" X 32"
The Rockin' Rider Brown Rocking Bull sings "I'm a Rockin' Bull" when his left ear is squeezed. Squeeze his right ear to hear 6 fun talking phrases with sound effects. 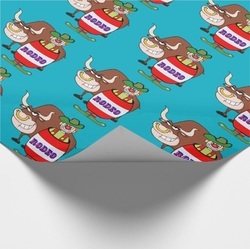 The bull has a synchronized moving mouth when he sings and talks. It also has embroidered eyes, soft plush horns, easy-grip handles, and non-slip foot steps. Recommended for ages 2 and up and to 80 pounds. Push the ears for sounds. It Is What You Make It ! 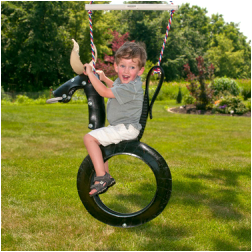 Yep, our ordinary tire swing magically turns into a bucking bull when a kid gets on it. 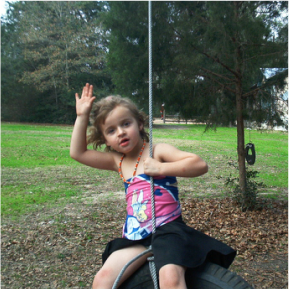 You may have seen this type of outdoor swing made from tires. The fist ones I saw were made like this except the head had a mane and some of them had a tail making them into horse swings. 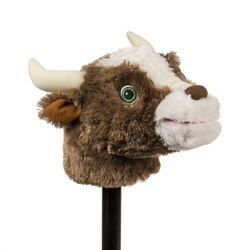 Now I see that these are available with horns making for a fun bull riding toy. They come assembled with decay resistant nylon rope . The swing will hold up to 175 pounds so kids will get good use of it for a long time. This is for the plans only to make this bull rocker. The picture is showing how it will look once completed. Buford the bull will turn out to be 19 1/2 inches at the seat. Get dad or grandpaw to build one for the little cowboys or cowgirl at your house. This is the type of toy that can last for years and passed down through the family. How much fun can a kid have with a stick ? This video will give you some idea how kids are having fun and getting serious about riding their bull. Next time there is a rodeo in town, check for stick horse barrel racing or bull riding. My grandkids have done it and we all had a blast. 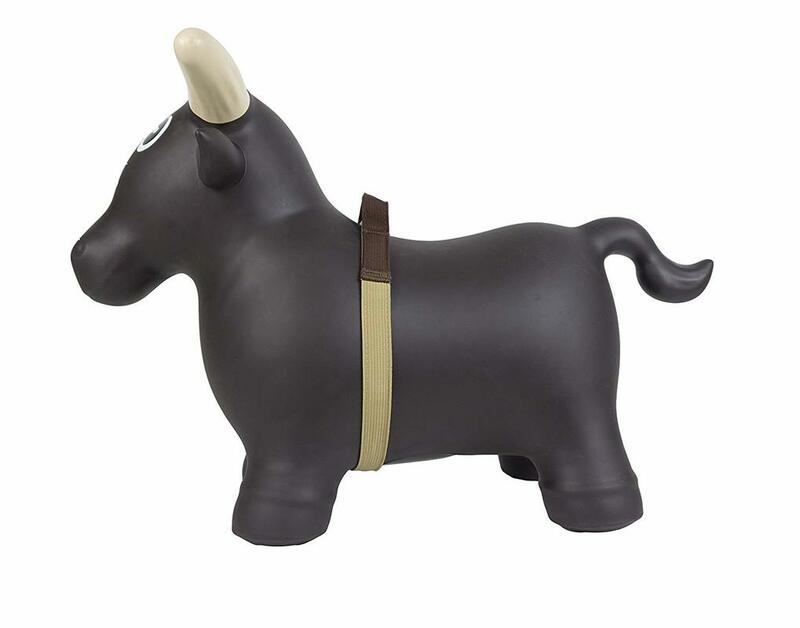 Watch this little guy ride his stick bull. Here is the Rockin' Rider stick bull. You can press his ear to hear him sing the rockin bull song or press the other ear for sound effects and phrases. His mouth moves in sync when he talks or sings. Batteries are included to make all of that work, after that, if your bull does a lot of talking and singing, you will need 3 AAA batteries. Other wise he will always be good to go under cowboy kids power! 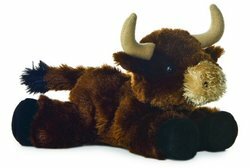 The bull is 28 inches tall and the head part is made of soft plush material. 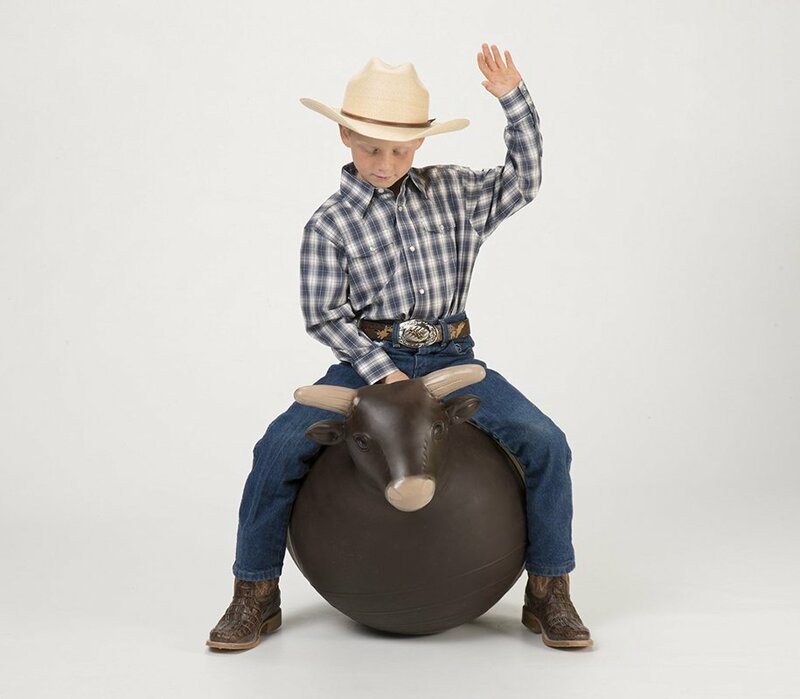 This is a fun bull costume that allows the kid to become the cowboy and the bull. We have the ﻿horse version﻿ of this at my house and the grandkids put many miles on it. This is a stuffed bull costume that you just step into and your legs become the bulls hind legs. The cowboy outfit is NOT included with the bull costume. Kids can dress just like a pro in a bull riding vest and chaps. These chaps come in small. medium, large and extra large. There is no exact sizing information on these chaps but I did read the review where the customer said that their child is 6 years old and wears a size 7 slim jean and that the large was a little short. I hope that will be of some help to you on the sizing. 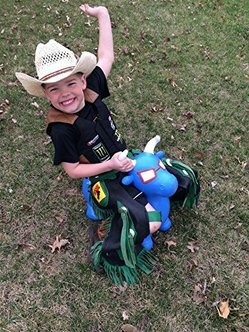 Kids will have fun dressing up like a bull rider in a vest designed to look like a pro. It has velcro adjustments for a good fit and has sponsor logo patches. 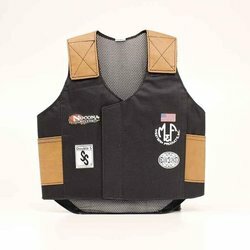 Most reviews for this vest suggest that it runs small so you may want to read some of them and get a better idea of the correct size for your child. 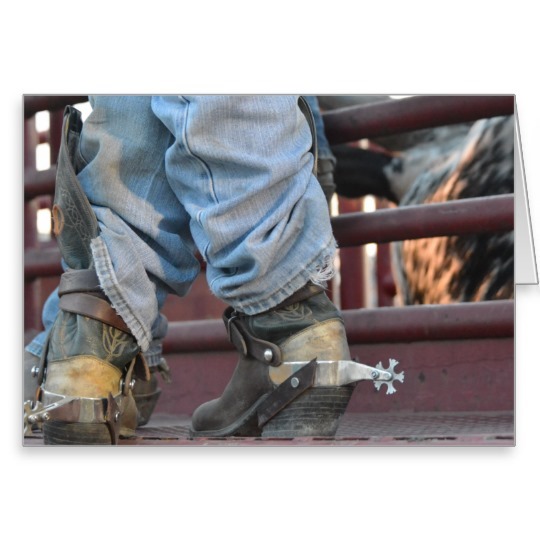 ​These are toy spurs that will make kids feel like a real bull rider. The are made of metal and have leather spur straps.. The tips on the spurs rowels are rounded for safety. These shirts are designed so that the childs head and face become part of the picture. 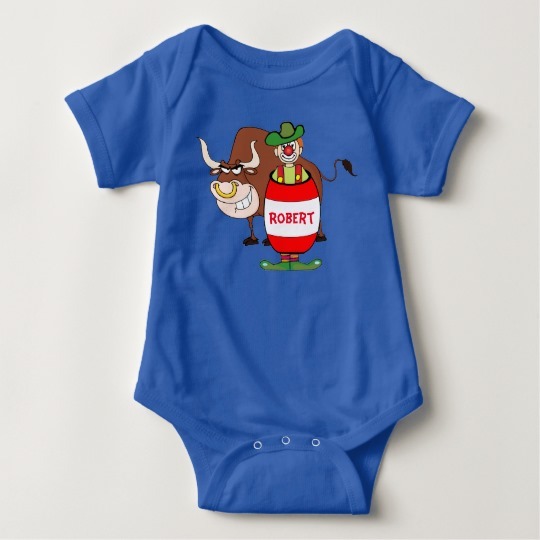 So just add a kid to this little bull rider t-shirt. They come in sizes 2t to 4t. There are kid size cowboy hats and other other items on my Western/Cowboy costumes for boys page. Out Of The Chute is available for Playstation 2 and Nintindo Wii. ​This is a board game and according to the reviews, kids as young a 3 are having a great time playing. End the day with a good book. I found these 2 cute books that bull riding fans will enjoy. They both have excellent reviews. Read about Patches the Bucking Bull in this book recommended for ages 6 and up. 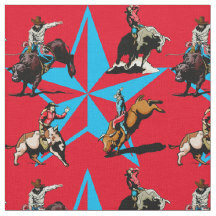 Everyone can help with this 100 piece rodeo theme puzzle featuring a bull rider and rodeo clowns. It will be 16 x 20 when finished and could make a nice framed picture for your wall when it is finished. Be sure to stop by my page with lots of free printables including this bull riding coloring page. There are coloring pages for more rodeo events, rodeo word games and activities. 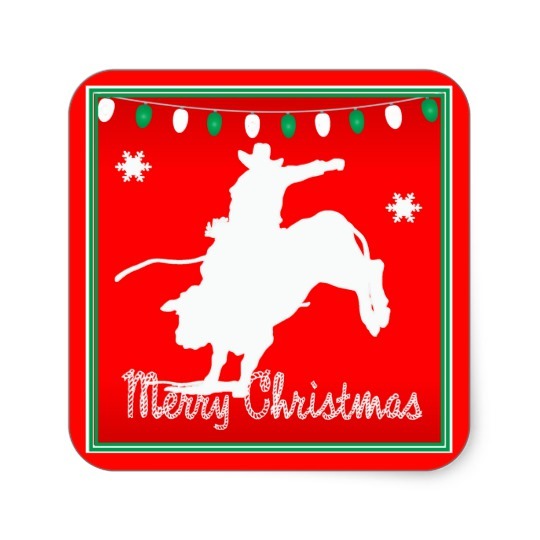 Find more of the best in western, horse, farm and rodeo toys here at Dancing Cowgirl Design. 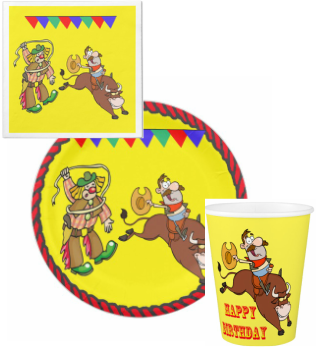 Visit my Rodeo Days Store for extra special items with bull riding themes like these below and more. This is a small sample of the products available. See other home decor, kitchen, bedding, bath and personalized gift items. 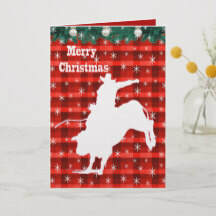 Bull Riding Christmas items such a wrapping paper, greeting cards, stickers and stockings.